Rich'd Kilby, Taylor and Salesman advertisement, 1757, Yale University Lewis Walpole Library. 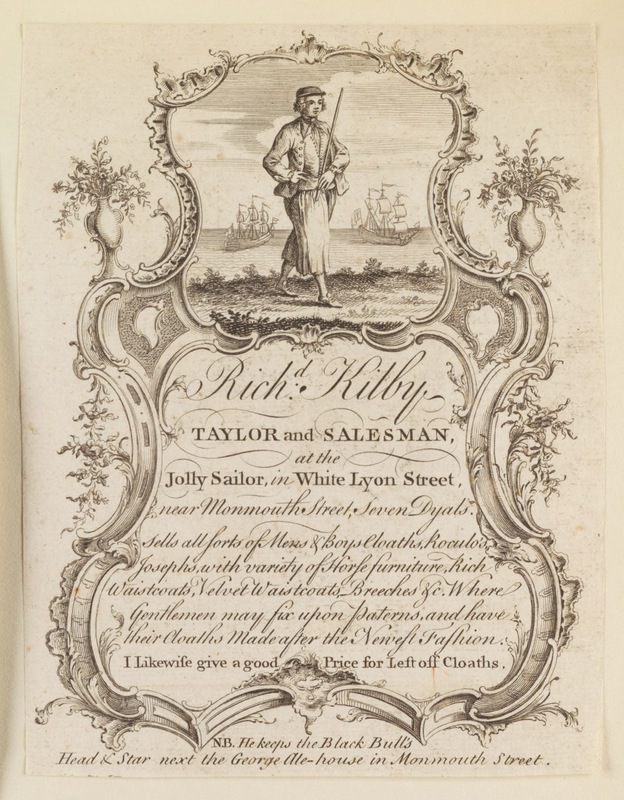 Encased in a fanciful border, this advertisement announces the services and wares of the tailor Richard Kilby "at the Jolly Sailor." When an eighteenth century advertisement announced that a merchant, artisan, or other professional could be found "at the," it meant a sign. Sometimes they would even say "at the sign of." In this case, I'm inclined to speculate that we are seeing his very sign at the top of this ad. The "Jolly Sailor" wears what appears to be a type of jockey cap. Now that it is shown so clearly here, I'm reconsidering many of my previous posts in which I thought I had spotted Dutch or Monmouth caps. A solid example of this would be the 1750 version of "Sailor's Return." His hair is very short and curly. The neckcloth is a solid color, but the exact color can't be guessed, as all garments are given the same hue, save the hat. We could conclude that the hat is black and everything else some lighter color, but considering his shoes are also without any color, it is very unlikely that this is the case. 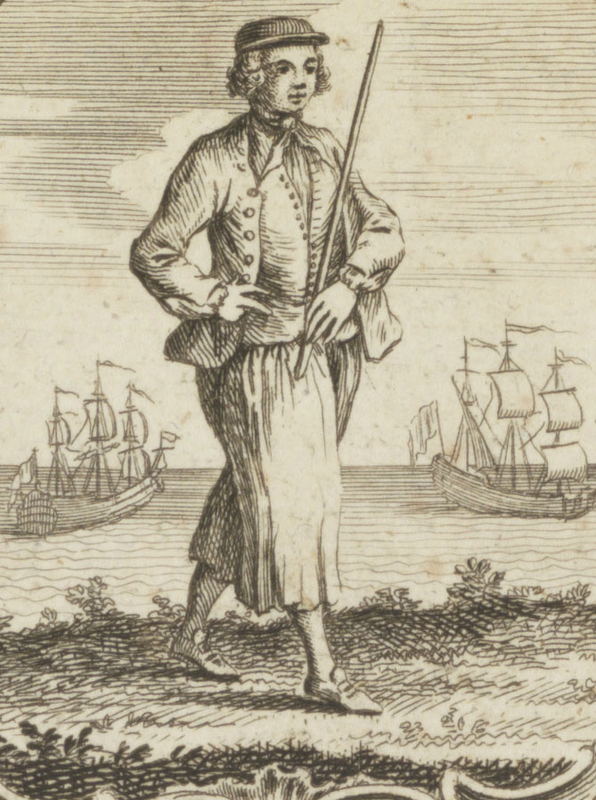 I have never seen an eighteenth century image of a sailor wearing anything but black shoes. His single breasted waistcoat is open at the top, with narrowly spaced buttons. It is without buttons, and ends with a cutaway at the waist. The tar's jacket is also without pockets, and has no collar. The cuffs are slash cuffs without buttons. Our mariner's slops end about the top of the calf. He wears stockings and pointed toe shoes with rectangular buckles. Of course, like any good tar, he carries his stick in a handsome fashion!